The 2011 Taiwan New Year Eve pyrotechnics sky show will be celebrating the nation’s 100th founding anniversary in Taipei 101 skyscrapers . The show is created by pyrotechnical master Mr. Tsai, Kuo-Chiang. There will be three spectacular themes; A Dragon Circling the 101 skyscraper, the Melaleuca Silver Waterfall, and the Great Tower of Zhenghui. After viewing the computer simulation, I was so impressed that it stimulated my strong desire to create. As I remembered I once wanted to create a GE firework show, however I was not capable of doing that then. Instead, I managed the 2008 Taipei 101 lighting show. This time I’m able to create the fireworks show, and it’s much easier to work with three well designed themes. I’m ready to give a try. It will be a challenge to myself. I first started with the Dragon Circling the skyscraper, which is most time consuming. It takes three days time just to layout the route, as it can be tricky to create a 3D route based on the film. To create the image of a dragon circling upwards, I tended to make it too complicated and the result was not satisfying. It also took too much space of the computer’s memory. Instead, I went back to my familiar “motion route method” (the same technique that I used for the “Marathon tour Taipei City“,”2010 Tour de France Google Earth Flight Tour“). As first, I do not know how create the simulation fireworks. Then I found, in Google 3D Warehouse, “Fireworks – New Year’s 2009 – Part of Open Challenge” by Bluesday. I was then able to create my simulation. I thought about using GE’s “sun” model to create a nighttime background. However, the firework’s color would loose it’s brightness under “sun” model. Therefore, I decided to use black as the background. Afterwards, I added some music to touch up my final creation. I would like to thank Google Earth super modeler Mr. Houng, Zong-Tong created a such wonderful “Taipei 101 building model”. Thanks to him, I will be able to present this showcase. I would like to thank all other model builder masters in contributing their effort in making it happen; such as Tantunny, Bor-Kai Hsiung, ect. Let me present this exhibition as my last show case of the year 2010. Let us celebrate the Republic of China’s 100th national founding anniversary. I wish peace and prosperity to all. 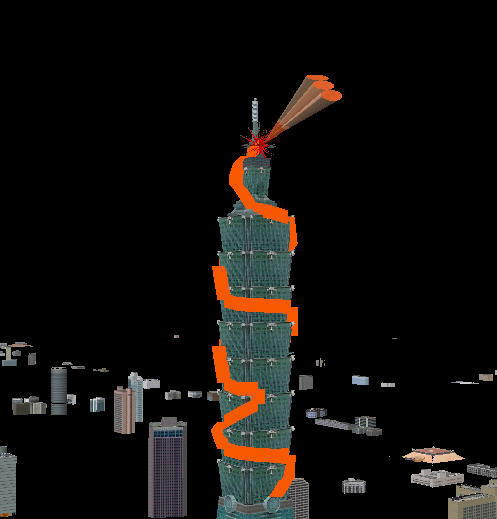 This entry was posted in GE 4D, GE Application and tagged 2011 Taipei 101 Fireworks in Google Earth. Bookmark the permalink.